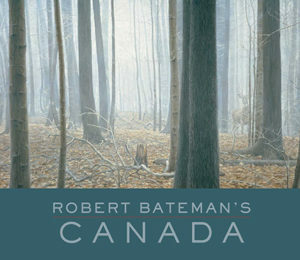 Robert Bateman is one of Canada’s most recognized and honoured artists. For more than sixty years his realism works have captured nature in stunning ways. The esteemed artist visited Picture This! 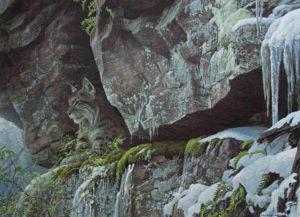 Gallery to exhibit his artwork and promote his latest book called Robert Bateman’s Canada. The Gallery’s media writer Greg Donnelly spoke with Robert about the new book, his longevity, and the importance of conservation. Greg: The book is images of your artwork just about Canada. Why did you decide that? Robert Bateman: The reason was because Canada’s 150 years old this year. My art is all about Canadian heritage, not only natural heritage but human heritage. That’s basically what the content of the book is. It’s all about Canadian heritage. Greg: It’s divided into the regions of Canada. The regions in Canada are very diverse from coast to coast and the prairies in between. How do you see that diversity in the regions play out in the country? Robert Bateman: What I celebrate is diversity. Although this talk I do is not a lament but what I do lament is what’s happening to diversity all over the world including Canada. Natural diversity and human diversity is being wiped out and being replaced with a kind of instant pudding uniformity. Diversity is what I think is fun and not only more interesting than uniformity, it’s safer. Robert Bateman: It’s well known monocultures whether it’s a crop or a forest, it’s far more vulnerable to disaster and being wiped out. I feel diversity gives so many possibilities. Monocultures are, like I say, not only boring but a bit vulnerable and dangerous. Greg: You’ve embarked on another cross country tour to promote the book. At 87, some people would say why don’t you just kick back and enjoy retirement. Robert Bateman: I don’t feel any different than I did when I was 47 or 57. What’s a decade or two? I have always gone out for hikes every day. I enjoy these tours and I work, if you can call it work – you know I’ve never worked a day in my life. I’ve never had a holiday. – I paint and work on my art 7 days a week until 10 o’clock at night. I find I could never get into relaxation. I’m always relaxed but I could never get into recreation, relaxation and just laying around. Greg: Is it tougher to travel across country and do all these interviews? Robert Bateman: It’s the same as it’s always been. It’s delightful this time to have my wife Birgit to run interference and make sure everything turns out well and also for the companionship. Greg: Do you get anything from the people during these talks? Do you still learn something from being there and interacting with your fans? Robert Bateman: Yes I do. What’s neat about it is it’s full of surprises. I might meet an expert, like I did recently, the foremost expert on spotted owls and endangered species. We were able to set up a trip into the remote forest of Washington State to see spotted owls in the wild. And one thing that touches my heart is having former students see me. I use to teach them as kids in my several decades of high school teaching. It’s nothing but positives from these talks. Greg: You mention you paint every day still. Where does the inspiration come after all these years? What keeps you going? 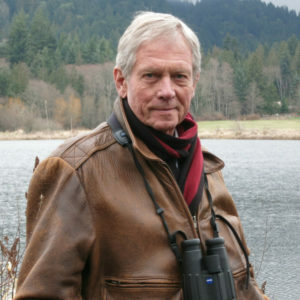 Robert Bateman: It’s the world of nature. I work from photography of course as do all realist artists. I have thousands of photographs. I don’t know how to do computers but I do know how to put the photos on my iPad. So I use my iPad for reference. I have never found a photograph is enough but I can combine them from all different sources and put them together in my concept. I am stimulated by requests. Somebody said they would like a painting with two minks. I’m struggling with that. Every one of my paintings is a bit of a struggle. I’m on my third version of the painting with the minks because I wasn’t happy with the first two. It’s always a challenge and always stimulating and nothing’s automatic. Greg: Is that something you’ve developed over the years in knowing what works and deciding when to start over again? Greg: You’re going to be in Edmonton on Friday. Picture This! Gallery has been working with you since 1985. What does it mean from an artist perspective to have that kind of relationship and longevity with galleries? 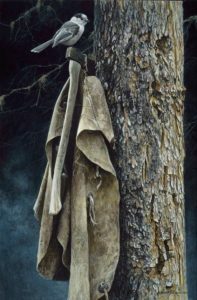 Robert Bateman: I like it of course. It obviously gives anyone a sense of satisfaction that I’m not a flash in the pan. I watch rock stars or people who have become famous and watch them come and go. So I have to confess it’s kind of nice to know the beat goes on. Greg: How do you get inspiration when you’re constantly on the road traveling? 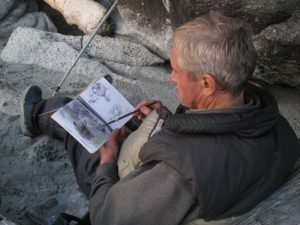 Robert Bateman: I’m booked solid so I don’t have time to go and explore. When I am in Calgary I try to make arrangements to have half a day and go to the Calgary Zoo. It’s one of the best places for animal collections in Canada. Pretty much all my tigers I have ever painted have been from a particular Calgary Zoo tiger. I saw it the very day they first brought it into the zoo as a young tiger and now he has died of old age. I do get inspiration that way if I have time off to go exploring. I’ve gone up to St. Paul, Alberta. Driving from Edmonton up to St. Paul I’ll pass by little potholes or a clump of willows and I’ll say ‘Woah pull over’ and I’ll click a few shots as we go along. I’ll take a side trip to Elk Island Park which I’ve based several paintings on the wildlife and landscape there. Greg: A portion of the proceeds of the talk goes to WILD NORTH, a rescue and rehabilitation organization in Northern Alberta. Why is it important to you to maintain conservation awareness? Robert Bateman: I’m told my prints have raised millions of dollars for conservation and that’s extremely important to me. I remember the heyday for my reproductions and prints was the late 80s and early 90s. I started doing large edition sizes. I said to the publisher I’m not comfortable because this is a licence to print money which is going into my pocket and my publisher’s pocket. That’s not right. I wanted to make sure the bulk of the profits would go to selected charities. Greg: Why is that important? 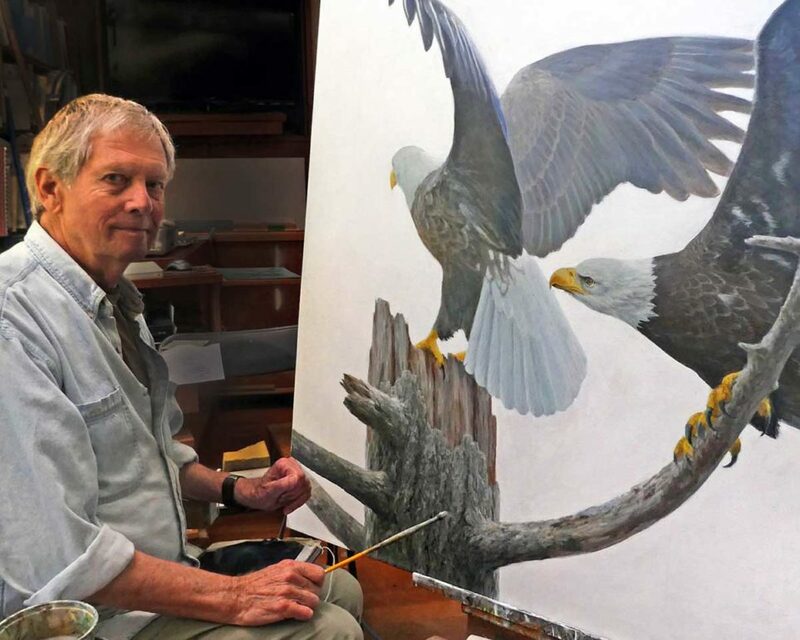 Robert Bateman: It goes back to my mom and dad, particularly my mom. She was a do-gooder. She was always trying to make the world a better place. Every Christmas she would bake an entire roast turkey with all the trimmings and take it down to an elderly woman and daughter who were very poor. I went down with her once or twice. It was quite an eye opener to go for that visit to bring turkey to these ladies. I think everyone should help and contribute to others. One of the great thinkers and humanitarian, Albert Schweitzer, said to a graduating class in a commencement speech, ‘I don’t know any of you but the one thing I do know is the only way to be truly happy is to be of service to others’. So maybe I do it just because I want to be happy. It seems to have worked out okay.